The Charter Company is a leading provider of the full range of private business jets and commercial airliners for Ad-hoc charter. This sector is a busy marketplace with a wide range of players ranging from major international charter brokers to small boutique broker firms. 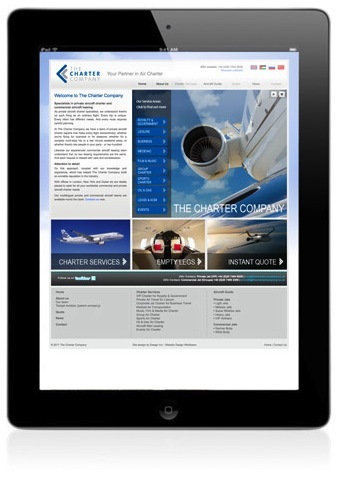 Design Inc has considerable experience across the Aviation industry and especially within business & private aviation and we actually designed and produced The Charter Company’s original website in 2005. We recently undertook a second major revamp in order to improve prospect engagement and rankings within search engines and also to reposition The Charter Company within commercial aircraft charter. This was an opportunity to upgrade the website in line with evolving industry trends, technology enhancements and subsequent evolution in best practice. The new web 2.0 search engine friendly web development for The Charter Company, along with improved navigation, messaging and data capture now features a full investment in search engine friendly optimisation, working in conjunction with pay per click Google AdWords. This improved search engine effectiveness for a wider range of pages & phrases from the team bios and service lists through to the private jets The Charter Company clients can choose from. The importance of driving visitors to your site cannot be underestimated. The ability to understanding what will drive visitors, and what they do when they get to your site is essential if search is to be a key part of your marketing spend. Search engine friendly web development best practice can include the following strategic elements as part of the mix: undertaking a search terms/phrases ‘Keyword’ report, selection of best performing and under competed-for phrases organic optimised placing of these phrases within the programming and visible site content, addition of a Blog to the website – to allow fresh searchable content to be uploaded and tactical key phrases to be deployed. Public Relations stories or news posted through blogs also provides the flexibility to use keyword insights from your search terms results. These elements combined with the more practical code, text and linking search engine optimisation compound the effectiveness of any investment even further. Search engine friendly web development is embracing more and more use of social media strategies. Widening a company’s online presence through professional networking sites such as LinkedIn, leveraging blog posts through Twitter and a company’s social life with Facebook are becoming key to website’s ranking performance an prospect engagement. The Charter Company now benefits from first page Google rankings for the search phrases ‘air charter broker’ & ’empty leg charter flight’. Go ahead try it for yourself! In addition to the search engine performance being greatly improved, Design Inc also provides complementary email marketing and data services for The Charter Company. Design Inc is a West London-based creative agency. View our website portfolio here. Please contact us by calling 01784 410380 to find out more about how we can support you with your own website requirements..